The Pakistani Taliban have said they carried out a gun and bomb attack in Lahore which killed at least 24 people. A senior Taliban deputy told the BBC by telephone the attack was in response to the army's operation in the Swat valley and he threatened further violence. The army is claiming sweeping victories against Taliban insurgents in the Swat valley, near the Afghan border. 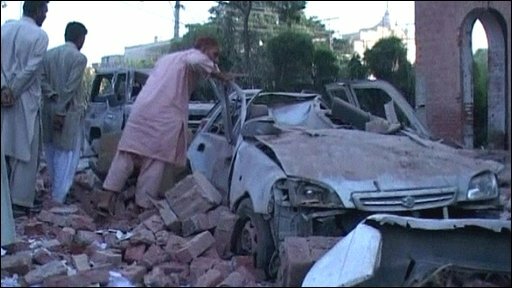 Hours after the Taliban claim, two blasts in the city of Peshawar killed at least five people. There has been no claim of responsibility for the Peshawar blasts. The army says more than 1,000 militants have been killed in the past month. There has been no independent confirmation of the figure. It says it has recaptured 70% of Swat's main city, Mingora, and expects to secure it in a matter of days. 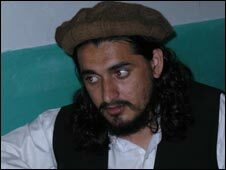 Hakimullah Mehsud, Taliban commander for Orakzai and Khyber tribal regions, told the BBC that the Lahore attack had been an act of revenge for the military operation in Swat. He accused Pakistani government forces of killing "many" innocent people. The Taliban had been preparing to hit Lahore from the day the operation started in Swat, he added. Promising further attacks on "government targets" in Pakistani cities, which he listed as Lahore, Islamabad, Rawalpindi and Multan, he called on residents to "evacuate their cities". More than 20 people were injured in the blasts at a busy market in Peshawar. Tahir Ali Shar, a resident of the city, told Reuters news agency he could see about 15 wounded people lying on the ground. Some of the wounded are believed to be in a serious condition. Shops and vehicles were damaged and television images show injured people being dragged out of the market to safety. 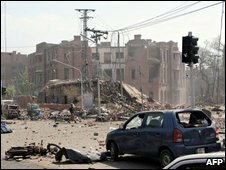 Pakistan's government said in the immediate aftermath of the Lahore bomb that it suspected it to be an act of revenge by militants in Swat. The attack on Wednesday, which injured more than 200 people, targeted buildings belonging to the police and intelligence agency, the ISI. A group of men shot at police officers before detonating a powerful car bomb, reportedly killing at least one ISI agent and 12 police officers, along with one child. Local officials speculated that the military intelligence agency could have been the target. Its offices were damaged while an adjacent police emergency response building was flattened. A least two arrests were made but police officials later told the BBC that those detained appeared to have been innocent bystanders. Lahore, in Punjab province near the Indian border, is known as Pakistan's cultural capital and is far from the Swat valley. Barbara Plett in Islamabad: "The Pakistani Taliban say they are planning more attacks"
But in March militants laid siege to a police compound in the city, killing eight people, and weeks earlier the Sri Lanka cricket team was attacked there. The BBC's Shoaib Hasan, in Islamabad, says Lahore is facing a sustained campaign of violence unlike any it has seen before. He says security officials believe the city is under attack because it is seen as a stable home for Pakistan's Punjab-dominated army. Meanwhile, the authorities have announced a cash reward for the arrest of 21 Taliban leaders, including Swat Taliban leader Maulana Fazlullah and his spokesman, Muslim Khan. Adverts listing the men - 18 with pictures - appeared in several newspapers on Thursday. Top Taliban leader Baitullah Mehsud already has a $5m bounty on his head posted by the United States.